For all the hoopla surrounding the whitewashing of what were originally Japanese characters and the hype that surrounded the source material from which Ghost in the Shell is based one might imagine it being easy to go into this movie with some sort of expectation. Given I have no connection to Masamune Shirow's original 1989 manga or the 1995 anime and understood that in order for such a property to get the big budget Hollywood treatment that it would require someone like a Scarlett Johansson in the lead role I went into Ghost in the Shell with no qualms and more or less an open mind in the hopes that ScarJo was only continuing to make interesting action movies concerning A.I. as she'd done not three years ago with Lucy. 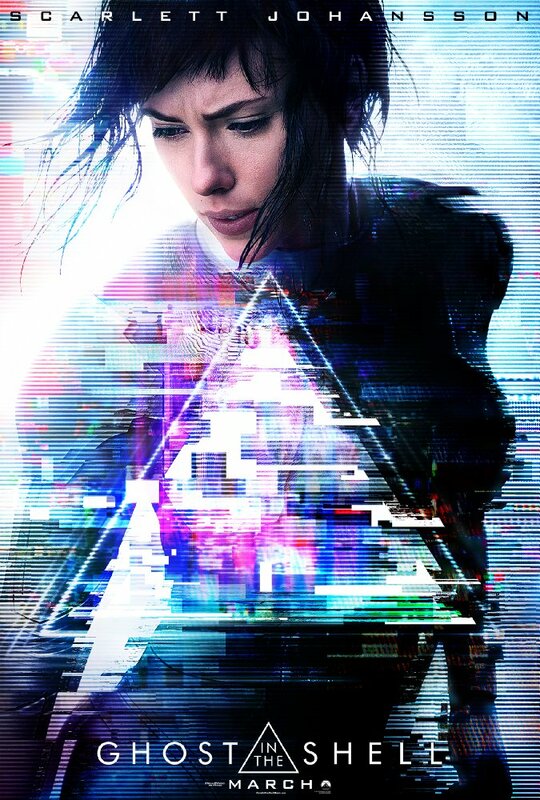 While Ghost in the Shell doesn't feel like a breakout in the same way that Luc Besson film was it is still very much an entertaining if not more dour experience than I half expected it to be given the color scheme of the marketing. 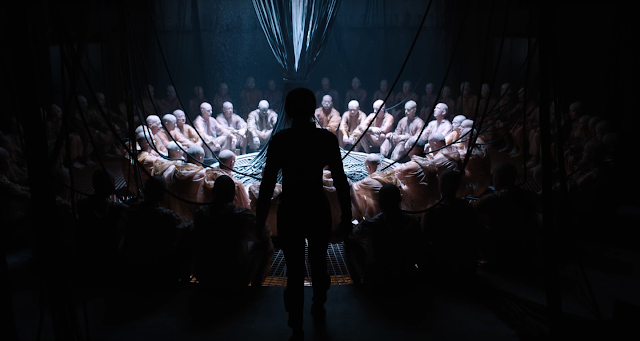 Speaking to color scheme, it is in the futuristic environment that Ghost in the Shell finds its greatest strengths. Rather than simply offering a few neat visual cues here and there director Rupert Sanders (Snow White and the Huntsmen) owes his production designer, Jan Roelfs (Gattaca, 47 Ronin), and art department a huge thank you as it is this fully realized if not somewhat familiar future world that gives the film a sense of uniqueness despite its overall derivative nature. Of course, the deal with Ghost in the Shell is very much the same as the case was with 2012's John Carter in that much of what the source material inspired in popular culture (namely The Matrix) this big screen feature will now be accused of resembling. It's a sad state of truth, but the order of exposure appropriates how properties are perceived in the larger scope of the public eye and in some cases can tarnish the brand name. Ghost in the Shell isn't bad enough to offend or truly tarnish the name of the material it has re-imagined, but more it isn't noteworthy enough to seemingly live up to the past incarnations that share its namesake. Given I have no connections to those earlier versions of these ideas I actually came away thinking Sanders film was well constructed, that it held more emotional heft than expected, and executed its main ideas clearly if not as effectively as it could/should have. Major (Scarlett Johansson) stumbles upon a few secrets her creators would rather she not know. © 2016 PARAMOUNT PICTURES.Â ALL RIGHTS RESERVED. And so, if you're like me and go into this film not knowing exactly what in the world Shirow created is about you'll quickly learn that Ghost in the Shell chronicles a future world (we're never told exactly how far into the future this is intended to be) where humans are allowing more and more of themselves to become robotic in nature and thus the inevitable idea of placing certain persons brains in better, more badass bodies is born and being done via scientists such as Dr. Ouelet (Juliette Binoche) and large corporations run by faceless CEO's. Out of these experiments we get the first successful case of a soul or ghost if you will, in the form of someone's brain, being transferred into that of a new, advanced shell. This shell looks like Johansson who, after completing the process and or/transplant surgery successfully, is named The Major and enlisted to work in a unit at the Department of Defense. It is here that our story really begins as Major and her peers, most notably right hand man Batou (Pilou Asbæk) and superior Aramaki (Takeshi Kitano), begin investigating a case where major players for robotics companies are being killed off which of course leads to much deeper, more complex questions and discoveries Major is forced to ask about herself and where she came from. Again, in my experience there was no preface to what Ghost in the Shell would entail and so the linear fashion in which the story is delivered lends great curiosity as to what all of these little elements we're being given might ultimately add up to. This is great as I was consistently engaged and despite the fact I felt we settled into the world the movie presented it never felt as if we became too comfortable with the narrative. Rather, the issue comes in the all too familiar scenario where the parts are greater than that of their sum. The questions posed are interesting and could potentially lead to fascinating discoveries and conclusions, but while there is some emotional substance as mentioned earlier, the conclusions the film does in fact draw are never as satisfactory on the level of intrigue the audience was at when those questions were posed. This essentially outlines the biggest flaw of the film in that it barely skims the surface of the themes it means to represent. There is one exchange specifically, where Dr. Ouelet attempts to console Major by telling her that she is, "what everyone will become one day," to which Major responds, "You have no idea how alone that makes me feel." This more or less encapsulates several of the things Ghost in the Shell seemingly wants to touch on be it the importance we place on scientific advancements over that of individual life or that of the fact one will never be able to have their cake and eat it too. Meaning, this idea of taking a functioning member of society's brain and placing it within the confines of a robot killing machine doesn't automatically result in what either the defense coordinators or the investors had in mind. It's either all robot and no compassion or what is more or less a human being, but should we ever introduce that human element into that of a majority mechanical shell-the results will always be the same-unpredictable. One thinks we might have learned as much by now, but this is yet another flaw in human nature; we are meant to learn from our mistakes, but most of us can't help but to keep repeating them. In that vein, Ghost in the Shell repeats many of the same pitfalls movies like it have run into in the past. As stated, there are portions of the film that easily stand on their own and provide an intriguing story and compelling enough characters that we're at least interested in them when the more engaging parts of the story kick in, but mostly Ghost in the Shell's script (written by Jamie Moss, William Wheeler, and Ehren Kruger) doesn't know how to balance the pleasing of the fanboys, the introduction of its premise and players to a wider audience, and the establishing of all the elements that are necessary were this to ever spawn a sequel or become a franchise. It won't, somewhat unfortunately, but again that is because the producers were likely too focused on the "What could be" rather than the "here and now". This is most evident when it becomes clear we, as viewers, haven't settled into the movie despite being an hour in due to the fact the narrative itself is just getting going as we cross that mark. We've established who the Major is and how she came to be, sure, but the necessary turn her character takes that should have spurned from the inciting incident doesn't happen until the end of the second act. Major dispenses the baddies with relative ease. Speaking of Major and who she is and how she came to be it was always going to be curious how Johansson might approach the role-how she might differentiate it from her previous heroine's such as the aforementioned Lucy as well as Black Widow. Though Major is mostly a robot the point is that it is the shell that belongs to those attempting to control her and not the ghost that still lives inside. Point being, it would only seem natural that she have a personality due to this combination of components, but Johansson possesses little personality here with the most memorable thing about her performance being that of the stilted yet direct walk she takes on every time she moves. It would be admirable to think in terms of the actress communicating much of her internal conflict, and there is a lot of that there-the character reaches a point of epiphany where she realizes nothing she has including her thoughts are real or even hers, through facial expressions and the change of her strict posture to that of the more limber, less strict body language that overcomes her the more she learns of her past. But as this is a movie that takes on the beats of a standard procedural with a hefty budget it's not hard to impose any number of trope-like characters we've seen in this role before over Johansson's Major due to the fact that for the most part she's a blank slate. All of that isn't to say Johansson's turn as Major is terrible or detrimental to the film in any way it simply doesn't make an already generic feeling actioner that much more plain. Fortunately for Ghost in the Shell the action set pieces along with the lived-in nature of the environment separate the film from falling completely under the generic umbrella. Though the climactic fight scene is plagued by one too many special effects shots where it looks like the budget ran out before they could finish rendering prior to that the action scenes are well paced and widely shot. The quick cuts and close-ups are completely absent and Sanders allows the movements of his protagonist to really be accentuated without ever resolving to tactics such as mega-slow-motion. We are allowed to soak up the moments and what is occurring and how the objective is creatively being accomplished rather than rushing us through them and asking us to rest assured our hero is badass enough to accomplish what the movie is telling us she is badass enough to do. We see why Major is desired to be the way of the future. It's only a pity Ghost in the Shell isn't equally as innovative, but instead is neither wholly intriguing nor as emotionally resonant as it would need to be in order to be this sullen and still agreeable.